does anyone else find it extremely funny that the Vampire arc took 10 years to essentially end on a joke? It was a nice bit of irony. All those years they waited so that they could rule the world only to wake up and find they are irrelevant. It was very Mignola. I would read a Howards and Frankenstein's Monster vs. dinosaurs & Faeries in the Hollow Earth comic. Yes religion dies, the monsters rise....not what they expected; should have paid closer attention to prophecy. I am not seeing it the way some here do. This story still feels disjointed and hard to follow. Not a bad book, and it is setting up the Big End. But "best issue ever"? I don't get it. Last edited by Kirby101; 01-10-2019 at 06:36 AM. I know you’d previously said you didn’t read Abe Sapien and that you were missing details on some stuff from books you hadn’t read, or had forgotten others. If there are questions you have, you’re in the right place to ask ‘em. I personally do feel that this is up there with the best issues of BPRD, though I’d probably go with something more personal, like the end of The Long Death, as my absolute favourite. Thanks, I was able to follow it alright. I just felt it was all exposition and build up. I just don't see it anywhere in the top all time issues. I'm nervous! What is next! I will say everything happening has been pretty mind blowing, lots of great pay offs for long time readers, but I get a little nervous that everything will not get wrapped up, that there will be many dangling threads. I guess that happens after 25 years of story telling, here is to 50 more! Last edited by KROENEN; 02-07-2019 at 06:28 AM. I’m pretty convinced we’re going to get a follow up book based on the Underground. It won’t be B.P.R.D. but it will be a continuation of the characters that make it out. Anyway, good issue. I don’t know how this gets wrapped up in two issues. Next issue is mostly a fight, final issue is the denouement, I suppose. Feels slightly anti climactic, but who knows what happens. I also kind of doubt our 3 make it out of this, but again, who knows. Logically, Abe is the most likely to actually survive...Hellboy could, but we're at the absolute tail end of all his prophecies so if he did, he'd genuinely be just a person...no weight of expectations. Which might be interesting. Liz doesn't necessarily need to die to fulfill her bit, though I wonder if burning the whole world--and possibly by extension the universe?--is something that would push her out of physical reality into the Vril-reality. I agree that there might be an Underground book coming, but I think there might be a bit of a wait between the two. I wouldn't be surprised if we took a year or two to do back story miniseries, then re-enter the modern day after some time has passed. 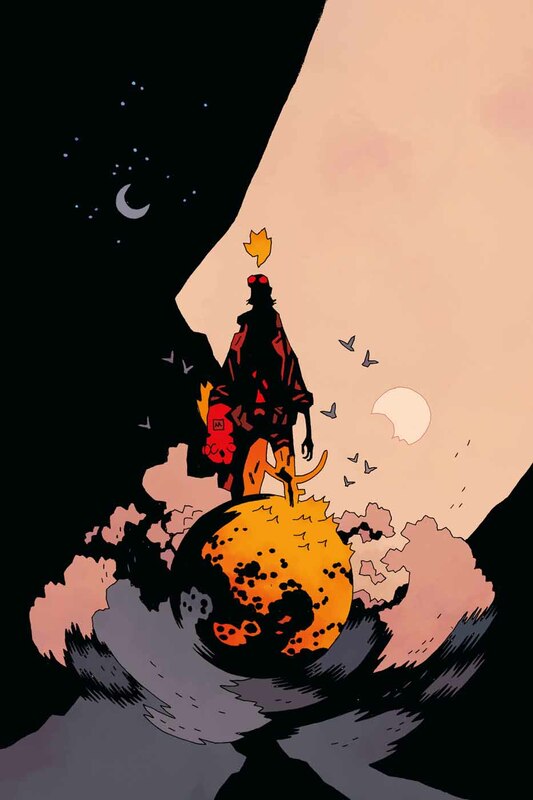 Speaking of a Hellboy, I hope we get some kind of concrete explanation of his physical return. It seems like he somehow used Roger’s remains to physically return to the world. Right? But... what does that mean? And if Hellboy “dies” during the final conflict, he returns to Hell, I suppose? I guess I’m still worried this isn’t going to wrap up very cleanly or satisfactorily. Especially after this issue, which I liked, but felt more like a stall than the calm before the storm I think it was intended as. Yeah, the thing about using Roger's body is also my biggest concern as far as 'unanswered questions' goes. There's a lot I'm willing to write off as intentionally mysterious/beyond mortal ken, but I think failing to explain that would just be lazy writing. Now this looks like the end of everything. Or almost everything. If the end happens to be Liz burning everything and the King of Fear vision it will be really impressive. 10 year of planing to go to a single final moment, that's something no today mainstream series can do - and to be honest, few had done something near this that I know about, like Fables, Cerebus, 20th Century Boys, maybe Sandman. PS: I read last issue listening the OST from Stranger Things Season 2 and it matches pretty well. The end is certainly nigh, wow, really makes me nervous, but issue #13 was beautiful, many poignant quiet moments in juxtaposition against extreme monster carnage. So many threads closing, it makes me sad and glad at the same time. I'm really hoping Frank shows up underground to help the survivors, coming back as kind of a savior to humanity after swearing them off so long ago. I love that they are coming to meet their fate, but on their own terms. They haven't lost their core, their soul, even after all the battles and scars, they retained the good of who they were.